The medium of cinema is inherently visual. Seeing as a film is merely a series of pictures strung together, this makes sense: the base of a movie will always be the moving pictures. Everything added on to these pictures merely enhances the experience. A musical score, sound effects, and dialogue help to enforce the visual themes represented on the screen. That being said, a film can be made that has one, two, or three of these auditory additions. A movie can also be made that has none of them, and the point will still get across. Perhaps this is why early films relied heavily on their visual elements: adding sound proved to be somewhat tricky because it required synchronizing with the pictures on the screen. This week’s two films examine some examples of cinema that doesn’t rely on dialogue to tell their story. Much like the picture books of our childhood, sometimes words are not needed for a simple story. Short films are regularly created in the same way. More often than not, animated shorts have no dialogue because their main characters are expressive enough to be able to drive the plot by their actions alone. In fact, many of the animated shorts that have won (and been nominated for) the Best Animated Short Oscar have had no dialogue at all. Even in feature-length animated films, like Up (2009), there are long segments, often in montage, that can portray a whole lifetime’s worth of plot without resorting to dialogue. But what about live-action shorts? These too can hold to a minimal amount of dialogue, especially if the plot is simple and the storytelling is well done. One of the best examples of this is the French short film, Le Ballon Rouge (1956). Even though the few lines of dialogue in this film are in French, the plot of The Red Balloon is simple to understand because the dialogue is so minimal. Of course, when one of the main characters, the eponymous Red Balloon, cannot speak, it makes sense that there is little to talk about. Despite this verbal inadequacy, the Red Balloon is quite sentient and develops an attachment to a young boy. As they play, the boy must soon go to school, which causes the balloon to follow him there and cause him to get in trouble for disrupting the class. Once out of school, the two of them find a young girl with a Blue Balloon that exhibits the same unique properties as the red one. Jealous of the boy’s aerial friend, some bullies pop the red balloon. To comfort the young boy, all the sentient balloons in Paris come to him and lift him into the air. Now I know what you’re thinking: aren’t there a whole set of films that have no dialogue at all? What about silent films? While I do recognize that these films didn’t have actors speaking their lines, most of them did have some form of a dialogue between characters, usually in the form of intertitles. Of course, there are exceptions in some of the earliest films, but a recent silent film, The Artist (2011), has shown we can still make silent films today, even if they do have a few spoken lines in them as well. What’s more impressive, however, are films that are of epic length utilizing minimal dialogue. Some early silent films (notably by D.W. Griffith) are more than three hours long without a single spoken word. 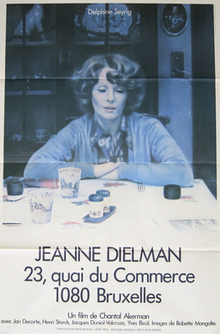 They did have dialogue, though, which is why Jeanne Dielman, 23 Quai du Commerce, 1080 Bruxelles (1975) is such an impressive film for its minimal use of it. With a running time quite a bit over three hours, Jeanne Dielman, 23 Quai du Commerce, 1080 Bruxelles examines the life of a single mother and homemaker. Since most of her time is spent alone in her house, there is little dialogue during the day. When her son comes home from school, they talk and eat dinner. Covering a timeframe of three days (almost in real-time), the audience gets an intimate and uneventful look into Jeanne’s (Delphine Seyrig) life and her many routines, including her stay-at-home profession as a prostitute. That being said, the tiny nuances in her schedule reveal that something is wrong. Small failures like dropping a freshly cleaned spoon on the floor and ruining dinner bother Jeanne in a way that eventually explodes in a session with a client, both sexually and violently. While a film of this length with as little dialogue as it has might seem tedious at first, its voyeuristic approach is enthralling up to the very end.